Meb Keflezighi is the only American to win both the Boston and New York Marathons. He was a state cross country champion while attending San Diego High. Desiree Linden became the first American-born woman to win the Boston Marathon in 33 years last April. She was a track/cross country standout from Chula Vista's Hilltop High when she was Desiree Davila. Marc Davis was an Olympic steeplechaser as well as a Footlocker National and state cross country champion from San Diego High. Kira Jorgensen won state cross country titles for two different high schools-Vista and, after they opened, Rancho Buena Vista. In other words, the San Diego Section has a rich history of outstanding distance runners both individually and team-wise. The section goes into the 2018 season with hopes of adding even more gold, silver and bronze to the cache with the La Costa Canyon boys and girls' teams jumping a division from III to II and not expecting to miss a beat after placing second and third respectively last year. Add Sage Creek girls in Division IV and any number of teams elsewhere if everything falls into place. Individually, LCC's Kristin Fahy, the fourth-place finisher in the state 3200 in track in June, is the clear favorite to be among those battling for a state Division II title but she isn't alone. 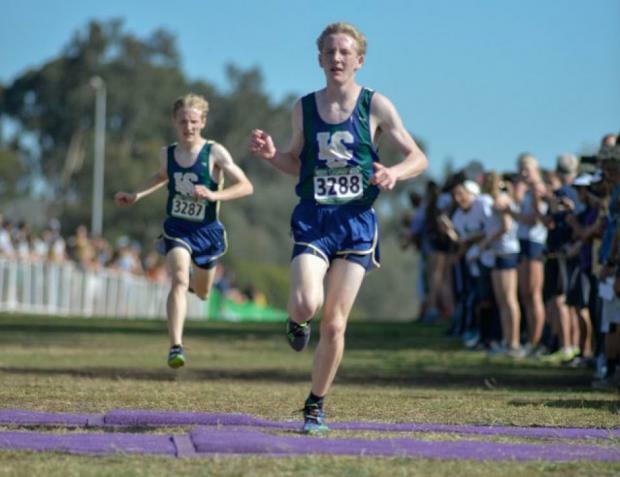 The Stanford twins, Garrett and Jacob (Clark Kranz photo above), were fourth and fifth for the Mavericks last year and based on time, they'll be expected to challenge, along with Dana Hills transfer Caleb Niednagel, for the Division II boys' crown. Anyone who saw Crawford's Ali Nader place 12th in Division IV a year ago could see he oozes talent. Only one runner ran the Division V finals faster than El Cajon Christian freshman Alaina Zamorano and now she has some idea how to traverse the course. Sage Creek's Skyler Wallace, who placed sixth in Division IV, is eying a top 3 finish as well. Save some room on the victory podium. Note: Rankings are based on database results for returning athletes at a certain distance. In this case, the distance is 3 miles. San Diego runs it championship at 2.96 miles, so athletes without a specific 3-mile time on their profile will not appear in the rankings. (Users are encouraged to filter a "2.x" rankings search of the database to see leaders for unspecified sub-3 mile distances.) If a team does not have at least five returning athletes to score, it will not appear in these preseason team rankings.